The Independent National Electoral Commission, INEC, has given 21 newly registered parties certificates of operation. 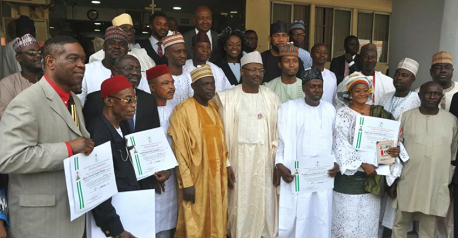 The commission on Wednesday at its national headquarters in Abuja presented the certificates to representatives of the parties. The registration of the parties was approved by the commission on December 14, 2017. The INEC Chairman, Mahmood Yakubu, at the certificate presentation ceremony said, in compliance with a judgment of the Federal High Court, the commission also registered the Socialist Party of Nigeria, SPN, making it 22 officially registered. The Federal High Court in Abuja in November 2017 had ordered INEC to immediately register and recognise SPN as a new political party. “We have already issued the certificate of registration to the SPN. The number of new political parties have risen to 22 in addition to the 46 parties already in existence. This means that the total number of political parties in Nigeria today stands at 68.,” the INEC chairman said. The parties are; All Blending Party, All Grassroots Alliance, Alliance for New Nigeria, Abundant Nigeria Renewal Party, Coalition for Change, Freedom and Justice Party, Grassroots Development Party of Nigeria, Justice Must Prevail Party, Legacy Party of Nigeria, Mass Action Joint Alliance, Modern Democratic Party, National Interest Party, National Rescue Mission and New Progressive Mission. Other include, the New Progressive Movement, Nigeria Democratic Congress Party, People’s Alliance for National Development and Liberty, People’s Trust, Providence People’s Congress, Re-Build Nigeria Party, Restoration Party of Nigeria and Sustainable National Party. Mr. Yakubu advised that the new parties operate within the law at all times.